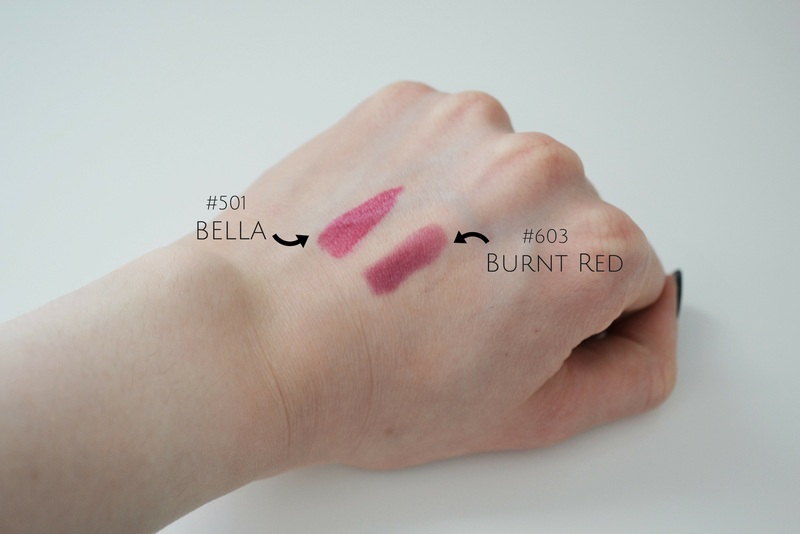 Whenever I'm looking at lipstick on a beauty counter, my hand automatically reaches towards the darker shades. Throw in a friendly/persuasive sales assistant and my hand begins placing the lipsticks into a basket and before I know it I'm buying more lipstick than I need. Again. But generally I'm very happy with my purchases and these two gorgeous shades from 3CE are no exception. 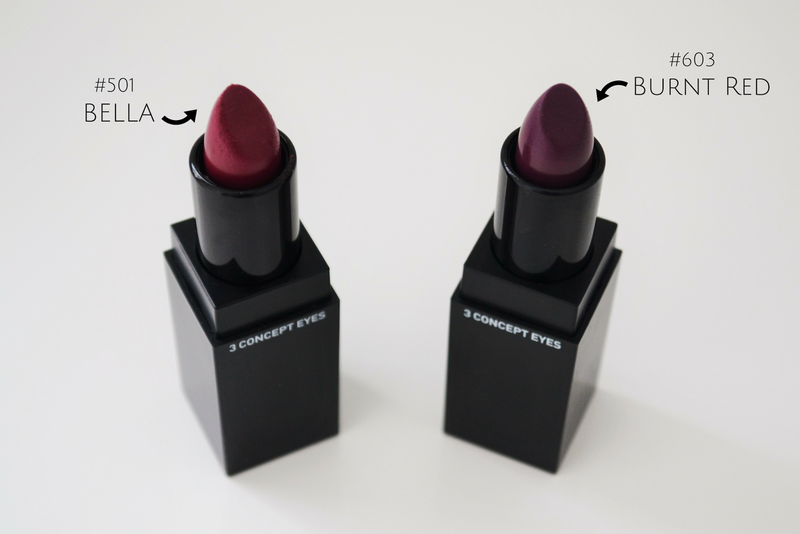 I thought I'd do a two-in-one review since these lipsticks are pretty much the same aside from their colours. The packaging: I have to say that this brand's packaging is ridiculously photogenic. I really love the cuboid packaging and semi-matte finish on the plastic. If you aren't a fan of black then 3CE also have pink packaging available. The pigmentation: These are nicely build-able, which is handy for darker shades. The application: They both go on pretty smoothly. I admit - about 70% of the reason I bought this shade was because of the name. The thought process went something like "Bella...that's kinda really close to my name...I shall make it my signature shade!". And that I have done! It's a gorgeous dark pink shade which isn't overly dramatic, so I find it easy to wear on a regular basis. Despite looking dark purple in the tube, the name of this one is true to its colour. I wanted something vampy to replace my expired Revlon Black Cherry and this has managed to take its place perfectly. Overall: I really love both of these lipsticks and they've been great additions to my unnecessarily large collection. I've been thinking to try some darker shades too! And Bella is such a great one to start with, Annabelle! Besides that: HOW GORGE is the packaging! Love black! Thanks a lot for commenting on my blog, sweetheart! Appreciate it! <3 Following you on bloglovin! I think Bella would suit you too! Beautiful shades, both suits you so well. Cute packaging, the black matte is so elegant. Lovely blog here btw! Would you like to follow each other on GFC? Please let me know on my blog so I can follow back. Thank you. You should! It's really popular in Asia right now and they have a lot of great products. Great colors, they look beautiful on you. Gorgeous colours! :) They suit you well! I just love both ! I just can't pick my favourite. I think Bella edges it for me but Burnt Red is lovely too! Amazinggggg packaging! Love these lippie colors. that packaging really is to die for! I'm sure it would suit you!